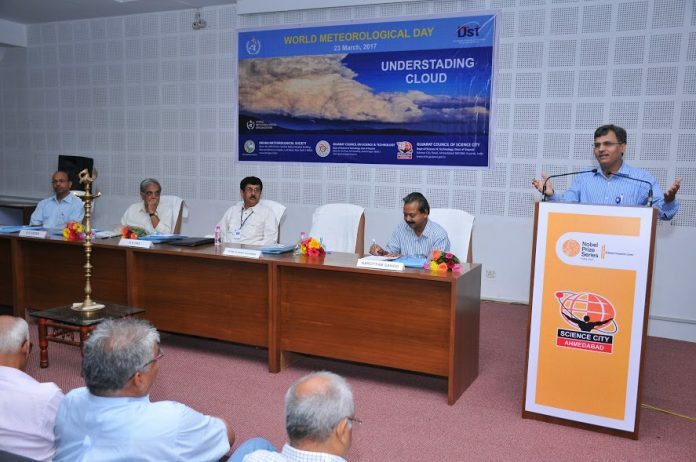 Ahmedabad : Gujarat Science City and Gujarat Council on Science & Technology (GUJCOST) and Indian Meteorological Society, Ahmedabad Chapter (IMSA) are jointly organized a series of programmes and activities to mark the World Meteorological Day (WMD) on 23rd March 2017. The theme of celebration is “Understanding Clouds”. The theme highlights the enormous importance of clouds for weather climate and water. Clouds play a pivotal role in weather forecasts and warnings. They help to drive the water cycle and the entire climate system. Clouds are one of the key uncertainties in the study of climate change. We need to better understand how clouds affect the climate and how a changing climate will affect clouds. Clouds play a critical role in the water cycle and shaping the global distribution of water resources. World Meteorological Day celebration provides an opportunity to celebrate the inherent beauty and aesthetic appeal of clouds, which has inspired artists, poets, musicians, photographers and countless other enthusiasts throughout history. Inaugurating the celebration, Shri D. K. Das, Associate Director, Space Applications Centre (SAC-ISRO) advised the students to inculcate scientific temperament and to explore the science around them. The simple observation, thinking and analyzing quality will lead them to be a scientist in future. Dr. Som Kumar Sharma, Associate professor in Space and Atmospheric Sciences division of PRL and Vice President, IMSA gave a brief account of various creative and innovative programmes and activities of IMSA for students and teachers. In the beginning, Shri S. D. Vora, Executive Director, Gujarat Science City gave an opening remark. Dr. D. Ram Rajak, Secretary IMSA coordinated the programmes and activities. The celebration also gave a tribute to Shri D. R. Sikka, who was known as the Monsoon Man of India and passed on 17th March 2017. Meteorology is a wonderful scientific subject which is challenging day by day. It does not recognize boundaries between states and countries, and the subject has provided a unique framework for the exchange of weather, climate and hydrological information and services across frontiers. The programme included a very interesting and exciting Met – Quiz, Popular Science Lecture by Dr. Bipasha Paul Shukla s hands-on demonstration. About 200 school students and teachers were attended the programme. It has been discussed that the modern science of meteorology began with the invention of an accurate barometer and thermometer. But many plants and animals are sensitive to temperature, pressure or humidity, and to an educated observer, the behaviour of plants and animals can be as helpful in predicting the weather as the records of a weather station. About 200 students from Kameshwar Vidhya Mandir Setellite Ahmedabad and 45 students from Sheth Amulak Vidhyalaya, Gota, Ahmedabad participated in the celebration of World Meteriological Day 2017 at Science City Ahmedabad.